Greg Gatien was born and raised in Halifax, there Nova Scotia where he began playing saxophone in the Halifax City Schools music program. He went on to earn his undergraduate degree in Music Education and Jazz Studies from Saint Francis Xavier University in Antigonish, Nova Scotia. During this time, Greg also studied privately with saxophonist Don Palmer, and began free-lancing throughout the Maritimes with prominent Nova Scotia-based musicians, including Gene Smith, Tom Roach, Dave Staples, Al Sutherland, Jerry Granelli, Skip Beckwith and Danny Sutherland. Greg moved to Boston for the first time in the early 1990s to study saxophone and improvisation with Jerry Bergonzi. During this two-year period, Greg continued to perform frequently, including work as a member of the Maritime Jazz Orchestra alongside Eastern Canadian jazz musicians Kirk McDonald, Chris Mitchell, Mike Murley, Jim Vivian, Greg Carter, and others. Greg would remain a member of this group until the late 1990s, performing alongside Kenny Wheeler, Norma Winstone and John Taylor and recording the JustinTime release, Siren Song. In the mid-1990s Greg moved to Rochester, New York to pursue his Master’s of Music (Jazz and Contemporary Media) at the Eastman School of Music. While at Eastman, Greg was a teaching assistant responsible for directing undergraduate small jazz ensembles, teaching undergraduate jazz pedagogy and improvisation, as well as teaching at the Eastman Summer Jazz program. While at Eastman, Greg studied with Fred Sturm, Jim Doser, Ralph Alessi, Ramon Ricker, and Michael Cain. Greg was an active performer during his time in Western New York, playing in a variety of jazz ensembles (large and small), jazz festivals, pop and R&B bands, as well as the salsa/ merengue band L’Orchestre Antonetti. At this time, Greg played alongside up-and-coming musicians Dave Restivo, Shane Endsley, Michael McGinnis, David Gibson, and Matt Mitchell as well as established musicians Gap Mangione, Jeff Tyzik, and Charles Ruggiero. Around this time, Greg was fortunate to have opportunities to perform with Maria Schneider, Joe Henderson, Bob Brookmeyer, and Benny Carter along with other prominent jazz artists and elders. Following the completion of his Master’s degree, Greg moved back to Boston where he began teaching at the New England Conservatory in both the Music Education Department (teaching graduate jazz pedagogy and supervising student teachers) and in the Jazz Studies Department (directing small ensembles). Greg’s interest in further exploring ideas of jazz pedagogy led to work with the New England Conservatory’s Research Center for Learning Through Music, where he collaborated with Larry Scripp, Warren Senders, Lyle Davidson, Jean Bamberger, Martin Gardiner, and Paul Burdick. After having been on faculty for little over a year, Greg began his DMA in Jazz Studies. During this time, Greg studied with Allan Chase and Bob Brookmeyer and played in a variety of ensembles in the Boston area, including the Indigo Invention Group (which released the recording First Story Book), a large ensemble directed by Brookmeyer, and in many other small and large ensembles. In these bands, Greg had the opportunity to play alongside Jason Hunter, Daniel Ian Smith, Dave Rezek, Joe Mulholland, Eric Hofbauer, Ron McClure, Jeff Hirschfield, Adam Larrabee, Billy Pierce, Carl Atkins, Benny Golson and others. Throughout his doctoral studies Greg continued teaching at New England Conservatory, served on a several committees, and began teaching K-5 music at Cambridge’s Peabody School as part of a research initiative exploring the efficacy of teaching improvisation as part of an integrated music curriculum. Greg also worked at the Conservatory Lab Charter School, assisted with the publication of the Learning Through Music Journal, participated in a Conservatory-hosted conference on music education, and assisted in the development of a new music education curriculum at the undergraduate and graduate levels. Prior to completing his DMA, Greg moved to Brandon University where he accepted a position on faculty at the School of Music that has involved the development of a jazz studies program. Since returning to Canada, Greg has been active as a teacher, performer and clincian. 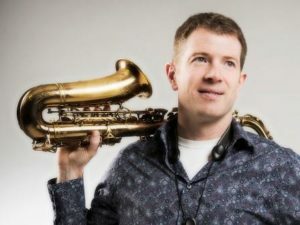 Greg has been the lead alto saxophonist with the Winnipeg Jazz Orchestra for the past six years, and has appeared frequently with the Winnipeg Symphony Orchestra. Greg has recorded for CBC on many occasions, performed at several jazz festivals throughout Canada, and was recently part of jazz composer/ trumpeter Dean McNeill’s Western-Canadian all-star recording project Prairie Fire, released on Cellar Live, also featuring Mike Downes, Ted Warren, Brian O’Kane, Hugh Fraser, Cambell Ryga, Kelly Jefferson, and John McLeod. Greg has been a member of the Red Lodge Music Festival for the past four years, where he collaborates with jazz pianist John Harmon, and is the director of the International Music Camp’s Jazz camp. He has been an adjudicator at educational music festivals throughout Western Canada, and is a Yamaha artist.